Bullet resistant glass is a glass typically made of a strong, transparent material that gives it the ability to withstand being struck by bullets. Naturally, it is not totally impenetrable. However, instead of shattering it can flex. Bullet resistant glass has many different names. One might call it bulletproof glass, transparent armor, or ballistic glass. What is bullet resistant glass used for? Well, it has more uses than one would imagine. These days, advanced means of protection as well as civil and military means of defense are becoming increasingly important for our safety. For example, several uses of bullet resistant glass include: glass panes for shopping centers, stores, banks, schools, residential buildings, embassies, etc. ; as well as for armored vehicles, military and civilian alike. Bullet Resistant Glass: How Is It Made? Plastic itself is not bullet resistant, but when put in between layers of glass, it deforms and absorbs the bullet’s energy and thus helps in preventing it from penetrating the glass – stooping it before it goes out the other side. In order to withstand the massive force bullets can confer on it, bullet resistant glass has gone through an evolution of different materials and methods for the purpose of perfecting it. It is most commonly made of laminated glass arranged in layers, thermoplastic and polycarbonate. The polycarbonate or plastic are layered between sheets of standard glass; this process is called lamination. The challenge in constructing bullet resistant glass is to make it as transparent and clear as regular glass while stilllensuring that its protective qualities are effective. Bullet resistant glass made with polycarbonate usually incorporates types of polycarbonate sheets such as Lexon, Tuffak, Makroclear, etc. between layers of standard glass. However, the glass itself also undergoes processes to make it stronger, namely, tempering. In tempering, the glass undergoes chemical processes or is treated with cooling and heating that strengthen it. 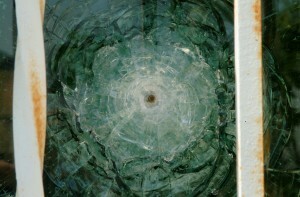 Plastic also serves as a key material in bullet resistant glass. Plastic itself is not bullet resistant, but when put in between layers of glass, it deforms and absorbs the bullet’s energy and thus helps in preventing it from penetrating the glass – stooping it before it goes out the other side. Other materials used in the making of bullet resistant glass are ethylene vinyl acetate, polyvinyl butyral and polyurethane. Bullet resistant glass made with these materials is usually used in military vehicles and tends to be very thick and heavy. In terms of thickness, bullet proof glass is usually 70 to75 millimetersthick. The thicker it is, the more resistant it is considered to be. Glasses of different thicknesses are needed to withstand penetration from different types of bullets. For example, a handgun bullet wouldn’t strike with the same force as a rifle bullet; therefore, a glass that is meant to withstand rifle bullets should be thicker. Bullet resistant glass can be affected by environmental factors such as UV radiation from the sun, temperature and exposure to certain solvents. For example, below zero temperatures can sometimes cause the creation of spall – small pieces that break off the polycarbonate. Polycarbonate can be affected by UV radiation as well – however, as long as it is under a layer of glass, it will be protected and not suffer consequences from exposure.